One very critical EDGE you get with Putters Edge Custom Putting Greens is a perfect blend of both worlds - Great Quality and a Great Price. There are plenty of places to find a putting green installer, and a blue million kinds of turf, each claiming to be the best. It is crucial in the turf business to offer putting green products that really do excel - to prove our claims and generating word of mouth that sets us apart. 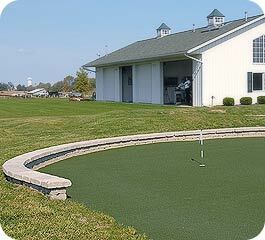 A Putting Green for Every Golfer. That means no matter who you are, and regardless of your budget or space limitations, we intend to match you up with a system that will improve your score, your confidence and most of all, your simple enjoyment of the great game of Golf. 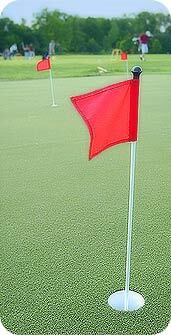 We do it by bucking the putting green business trend completely. Most companies are bound by contract to represent a single distinct turf manufacturer, regardless of the golfer's individual needs. From our point of view, it borders on downright crazy; what a huge drawback for the golfer/customer! The best "perfectly personalized" practice tool in your budget range. When we design a green for you, it's done from information we've discussed together. We then use the perfect turf or combination of turfs for your distinct situation - chosen from the many different options we carry. Through constant research, we keep our edge by offering a complete line of solutions regardless of manufacturer. Most of our customers choose our state-of-the-art Pure Absolute Roll™ nylon turf. This proprietary PAR Turf™ does not require sand fills, making it virtually maintenance-free. PAR™ synthetic turf is the flagship of our entire business. We created it because no one else met our top-end requirements: Pure Absolute Roll. The exclusive synthetic turf brand from Putters Edge Custom Putting Greens, designed for pros! Pure Absolute Roll is the key. Year after year, PAR Turf keeps it's incredibly natural feel and stands strong against wear and tear. The fibers are extra tough, and spring back into position consistently. But the real beauty of PAR Turf is the way it putts - as close to a real "country club " green as we've ever found. With our stimp speeds that duplicate those of championship greens, we're certain you'll quickly agree. Our Tour Edition turf is quick; with a stimp speed of 11, it's designed to give you the pro tour experience. Our Private Edition is a lively turf speed of 10.4, which mimics your country club's greens. Next is our Classic Edition at 9.3 stimp; a medium speed turf that replicates the most common public golf courses. Our Wedge Edition is a specialty golf turf designed specifically for approach shot work, allowing your chips and wedge shots to bite just right. A "good price" for an inferior green is no bargain. Often, such a green will literally end up in the dog's house, after it quickly wears out and begs for replacement! We call that a crime. Buyer beware! You deserve the most realistic green you can afford, and we'll give our all to achieve that balance. Our best systems usually feature top-quality PAR™ synthetic turf, but not always. For many reasons, we'll choose something else to create the ultimate green system for your exact environment. It truly is both a science and an art, but you'll know that from your very first putt. But what about quality greens for the smallest spaces and budgets? If a 2,000 square foot luxury outdoor dream green isn't possible, don't fret! We recognized that need after seeing the lack of quality and value available at low price points. We have pre-cut putting greens to match any need.